I had so much fun planning and preparing this dinner that I am seriously considering making it an annual event. 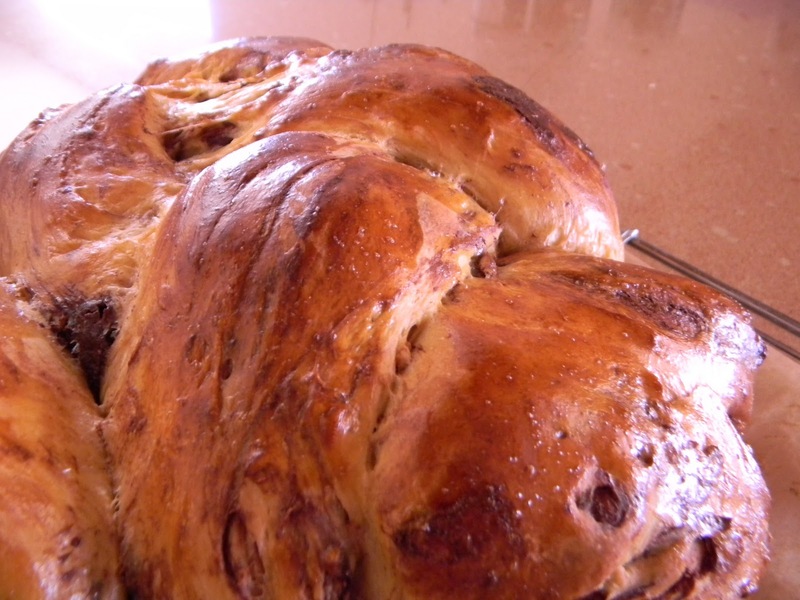 We started with chocolate chip challah, which was delicious. I used the recipe from the book Chocolate Chip Challah and Other Twists on the Jewish Holiday Table, pretty much as it appears in the book. Not being a newbie to baking bread, I streamlined and used my own processes where applicable. The challah dough called for the addition of a sweet potato, which made the resulting bread a little moister and more colorful. I'm going to try this recipe again without the chocolate chips and will report more after that. The butter whipped with fudge sauce (1/2 cup butter to 2 Tablespoons fudge sauce) was an excellent spread for this rich bread. 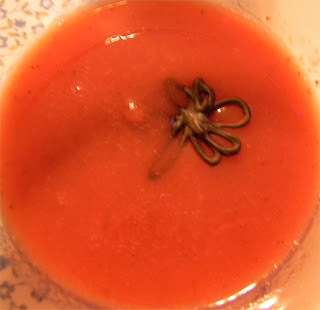 At my friend's request, we had Strawberry Soup. To give it a chocolate twist, I made chocolate garnishes to float on top. I tried to make some chocolate ducks (because zombies were too difficult), but most of the garnishes looked more like generic flowers or butterflies. Or maybe bugs? Whatever, they tasted just fine. For vegetables, there was a green salad, a Waldorf salad, and a carrot and onion dish. The green salad included cacao nibs, the Waldorf salad had chocolate chips, and there was a cocoa glaze on the carrots and onions. I also put together a vinaigrette that included a little cocoa powder, just to continue the theme of the evening. The green salad with cacao nibs and cocoa vinaigrette was the big winner in the vegetable department. I used Ghiardelli chocolate chips in the Waldorf salad and I think they were just a little too big to work well. Next time, I might try milk chocolate chips instead. The glazed carrots and onions were nice, but I think I will skip the onions next time. They were a lot of work to prepare and kind of overwhelmed the more subtle flavor of the carrots. 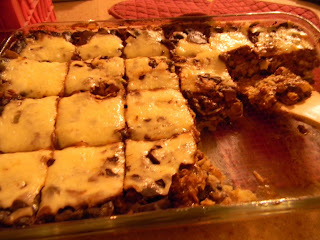 The chocolate chip kugel was a big success. 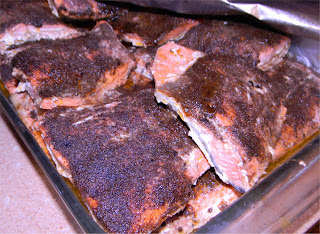 As was the salmon with mole rub. (For the uninitiated, "mole" is a Mexican word that mostly indicates a mixture of things, but has come to mean a sauce or spice mixture that includes unsweetened chocolate as a flavor intensifier.) Actually, the salmon was delicious even though I didn't cook it on a grill like the original recipe suggested. I don't own a grill, so I baked it at 400 degrees Farenheit for about 15 minutes and then warmed it up again before serving. The salmon was definitely one of the high points of the meal. The other mole entree was less well received. I had made a tortilla and black bean casserole with a mole sauce, but the sauce was a little overwhelming, probably because I used the hottest chili powder I had. 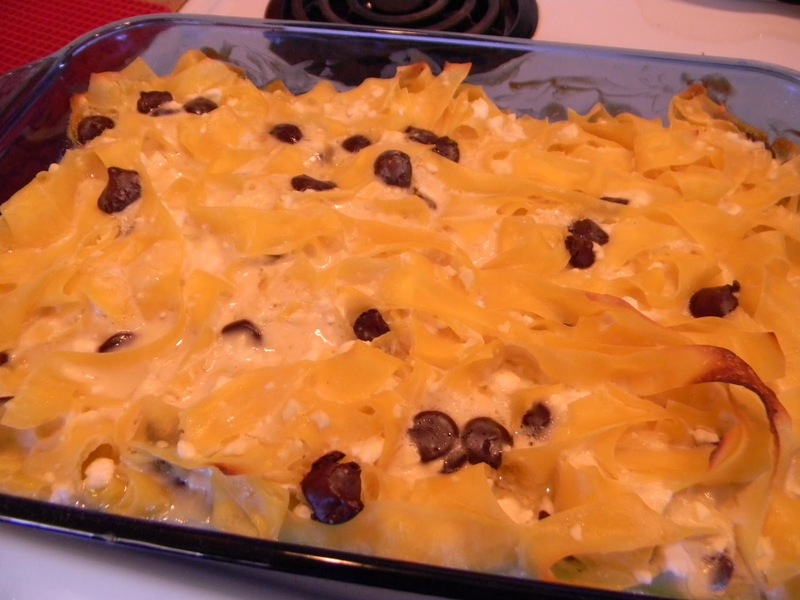 I'm going to try again before going into great detail over that casserole. 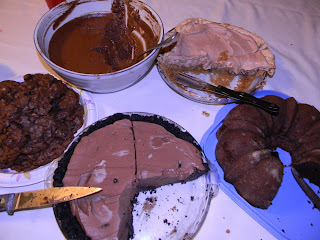 Last, but not least, we had five chocolate desserts to end up the evening. Between the main meal and the desserts, however, we decided to play Apples to Apples to give our food time to settle. Starting with the bowl at the top left and moving clockwise, we had Chocolate Orange Mousse, Chocolate Nut Pie, Chocolate Mint Pound Cake, Chocolate Ice Cream Pie, and Death by Chocolate cookies. The "yum" factor was enormous. Before I get back to my schedule, which was interrupted last summer and never resurrected, there will be a Chocolate Dinner. The Chocolate Dinner deserves a little bit of explanation. About 5 years ago, while I was the Youth Director at my synagogue, I was looking for a new and exciting fundraising idea. Somewhere in the course of discussions with various people, we came up with the idea to have a Chocolate Shabbat Dinner where every dish would contain chocolate in some form. The dinner was not wildly successful from a fund-raising point of view, possibly because people thought that everything on the menu would be sweet and candy-like. Considering we had a green salad whose concession to chocolate was cacao nibs and the main dish was chicken mole, I was baffled by this reaction. But whatever. Those of us who planned and prepared the meal had fun testing recipes and the vast quantities of leftover food went to a family in need. Fast forward several years and one of my good friends here is leaving to return to the East Coast. Good for her. I hope to follow her East as soon as I can sell my house and all that stuff. She asked if I would be willing to make a chocolate dinner for her before she leaves. Not a fundraiser this time, obviously, and all the people at the dinner will be good friends. How could I turn this down? The actual dinner will be on March 25, but I have finalized the menu and already made the soup (the ingredients were on sale this week and I have lots of room in the freezer). So tonight I'm going to post the menu, and over the next two weeks you will see more about the various dishes that will make up the meal. *This one deserves a bit of explanation. Paula Deen has published a recipe for chicken mole enchiladas. I made the casserole more-or-less as she described, using fake chicken strips instead of chicken. The mole sauce was delicious, but the layer with the "chicken" called for 2 packages of cream cheese and a pound of sour cream. The combination was a little much in my family's opinion, so we decided to keep the mole sauce but use a filling of seasoned black beans and cheese. It is just possible that I will not make ALL of those desserts for this dinner. But there's a good chance that anything I don't make for the dinner, I will make at some other point in the future. Except for the ice cream. That I will purchase. The only flavor of ice cream that I make at home is vanilla. Now that the menu is set, I'm kind of looking forward to preparing this meal.